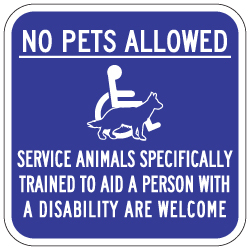 No Pets Allowed Service Animals Are Welcome Signage - 12x12 - Non-Reflective Rust-Free Aluminum No Pets Allowed Signs for Outdoor or Indoor Use with Anti-weather and Anti-graffiti protection Available. As of March 13, 2011, the ADA was rewritten so that animals other than dogs are no longer considered as service animals. There were too many problems with people entering businesses with "service birds", "service snakes", "service pigs", "service tarantulas", etc. While it was clear that these animals were likely not "individually trained to do work" and therefore did not have to be admitted, often times there was little business people could do to discourage people from bringing the animals in. Only dogs will be recognized as service animals. Service animals are required to be leashed or harnessed except when performing work or tasks where such tethering would interfere with the dog's ability to perform. Service animals are exempt from breed bans as well as size and weight limitations. While there are websites where anyone can pay a fee to "register" their service dog, this purchased registration is no guarantee that the person purchasing the "registration" has disabilities as defined by the ADA, or that their dog meets the definition of "service dog". (see above definition of service animal) The one exception that the Department of Justice allowed in the rewrite was to permit miniature horses being used as guide animals to accompany individuals who are visually impaired. The ADA is very clear in their definitions that service dogs must be "individually trained to do work or perform tasks".